Quality education provides the basis for the future, since education provides the freedom to choose.....employment opportunities. Supporting Higher Education for Girls "educate a girl - educate a family"
Education grants are provided to aspiring students for pursuing higher education. Preference is given to girls. We support the students pursuit from start till graduation. Ten students at various stages of their education, have been supported since the inception of the trust in 1998. Farineh Abbas, lives with her widowed mother and received support to complete her Masters in Human Resource Management. She is now employed in the corporate Sector. Bilgees Begum is our main recipient. The eldest of four children, it was her dream to be a physiotherapist. CARESS has been supporting her studies since std 9. She got completed her Physiotherapy course in 2010 and achieved her dream. She is now a qualified Physiotherapist, wife and mother. She leads a fulfilled life and also provides some financial help to her parents and younger sisters. She reinforces the saying if you educate a girl you educate and support a family. This Scholarship fund was started in 2006 with 8 children placed at Steiner memorial school. Dharchula. 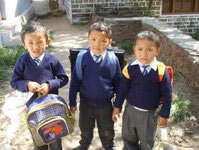 This year we have supported 25 Rung children, attending five different schools in Dharchula, Haldwani and Champawat. This is because parents often send their children to live with extended family members who have a steady government job and live a settled stationary life. Thereby the children can pay attention to their school and studies. The youngest is in kindergarten and the eldest is in grade 8. To improve facilities for the children at school we are supporting the summer schools at Burfoo village in Johar valley and Budi Village in Vyas Valley. 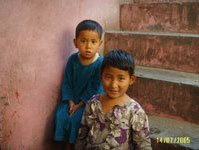 We have made small improvements by providing books and teaching aids and a wool carpet for the children to sit on. Equipping School Libraries and providing a reading room for children and adults. Seven Rung Children (4 girls and 3 boys) have been enrolled from nursery at a the Steiner Memorial School at Dharchula since 2006.